Protest in Germany against reliance on coal. Photo from WWF's Twitter page. 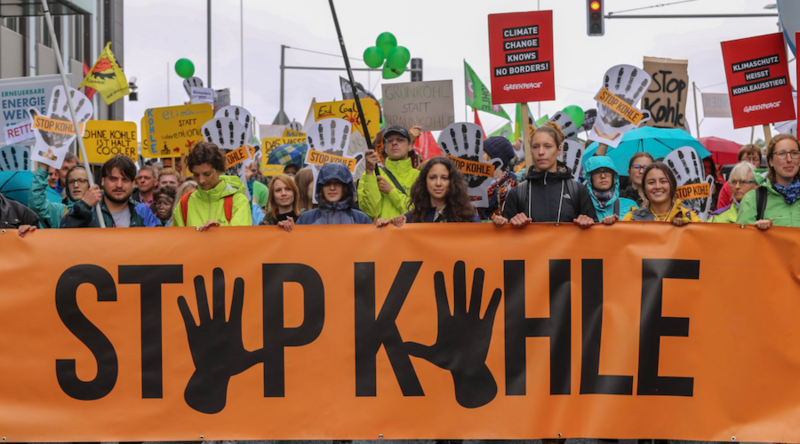 Residents of five German cities, including Berlin and Hamburg, took it to the streets on Sunday to protest against the country’s reliance on coal for power production. According to Deutsche Welle, the massive rallies were aimed at pressing the Angela Merkel administration two days before a state commission on coal consumption is to convene for the first time. The commission is tasked with finding a way to eliminate Germany’s dependence on the black mineral. A report by the Associated Press states that about 22 per cent of Germany’s electricity comes from burning lignite or brown coal, 12 per cent from hard coal and 33 per cent is generated using renewable energy. Both black and brown coal emit considerable amounts of carbon dioxide into the atmosphere when burned. Besides demanding a boost in green energy sources, protesters were also expressing their rejection to a recent announcement by the environment minister, Svenja Schulze, who said the country will likely miss its goal of cutting emissions by 40 per cent from 1990 levels by 2020. According to the protests’ organizer, WWF, Germany's CO2 emissions have not dropped for nine years.